The Westwood home, situated in Comstock Hills, at 1410 Comstock Ave LA CA 90024 lasted 27 days on the market before accepting an offer on 8/23/11. 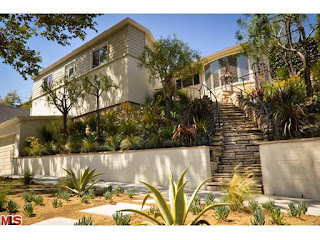 The home was listed on 7/27/11 with an asking price of $1,249,000 |$645.81 $/sf|. And on 9/27/11, the home closed for $1,200,000 |$620.48 $/sf|. According to the MLS, the home is a 4 bedroom / 2 bath, 1,934 sf of living space on a 5,749 sf lot. A few things about this house: the home is up a flight of stairs and sited uptop a hill, as are most homes in this area of Westwood, smaller patio like backyard, contemporary feel to the home, move-in condition but not updated with high end finishes.